WHAT IS LAG B’OMER AND WHEN DO WE CELEBRATE IT? Every Jewish letter has a number value depending on its position in the Hebrew alphabet. The Hebrew word lag is written with the Hebrew letters lamed and gimmel which, together, have a nember value of 33. Thus Lag baOmer means ‘the 33rd [day] in the Omer’. This always works out to be on the 18th day of the Hebrew month Iyar. Lag baOmer is a joyous holiday. On Lag baOmer we remember two important events: the end of a plague of sickness which had killed 24,000 students of the famous Rabbi Akiva and also the death of a brilliant student of Rabbi Akiva’s, Rabbi Shimon bar Yochai. Over 2,000 years ago an army of Romans invaded Israel and destroyed the second Holy Temple in Jerusalem. The Romans were cruel to the Jewish people and wouldn’t let them study or teach the Torah. However, some brave and very clever rabbis refused to obey the Roman rules and taught Torah in secret. One famous rabbi named Akiva continued to teach his students lessons from the Torah. The Romans heard about Rabbi Akiva and began to look for him. So Akiva thought of a way to protect himself and his students while still teaching Torah. He told his students to carry bows, arrows and picnic lunches. Then the students should go to the fields. It would look like they were there to hunt, not study with the rabbi. When the Roman soldiers saw the Jews going out to hunt they let them pass. But each day when the students reached the fields Rabbi Akiva met them and they would learn and study together. Before becoming a rabbi, Akiva was a poor shepherd who married a woman named Rachel. She convinced him to study and he became a very learned and well-respected rabbi. 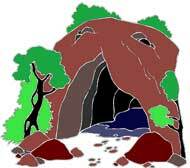 Rabbi Akiva and his students (dressed up as hunters) would go to a cave deep in the woods and there they would study Torah. WHO WAS RABBI SHIMON BAR YOCHAI? Shimon Bar Yochai was one of Rabbi Akiva’s best students. He fought hard against the Romans and also wrote great Jewish texts. Rabbi Shimon suffered terribly at the hands of the Romans, because he was determined to make sure that the Torah would not be forgotten. The Romans sentenced him to death, so he was forced to go into hiding. Rabbi Shimon and his son Elazar fled to a cave in the north of Israel. They had no food or water with them, but a miracle happened and a carob tree sprouted in the cave, along with a stream of water. They would spend the entire day studying Torah this way. When the time for prayer arrived, they would put on their clothes, pray and then return to the sand. Rabbi Shimon and his son lived in the cave for 12 years, doing nothing except studying Torah. One day, Elijah the prophet came to the cave and announced that the Roman leader had died, and so Rabbi Shimon was no longer in danger. Rabbi Shimon became the greatest Torah teacher of his generation. On the very last day of his life, he called together his students and spent the entire day telling them the deepest mystical secrets of Torah. HOW DO WE CELEBRATE LAG BAOMER? To celebrate Lag baOmer, Jews all around the world light bonfires. These bonfires remind us of the great fire that surrounded Rabbi Shimon. In Israel, for weeks before, children collect wood to arrange as impressive bonfire towers. Great public celebrations are held and the wood towers are burned on Lag baOmer. Israeli towns are filled with torches and bonfires in the streets and on the rooftops. On Lag baOmer many people go to visit the tomb of Rabbi Shimon in the Israeli town of Meiron. On just that one day, about 250,000 Jews visit Meiron, dancing, praying, and celebrating the wonderful things that Rabbi Shimon did. It is a custom for some Orthodox Jews, especially Hassidic Jews, to let their sons’ hair grow for the first three years of their life without cutting it. As haircuts are not allowed during the Omer period, but are allowed on Lag baOmer, there is always a backlog of boys who turned 3 and are ready for their first haircut but have not yet had it. This means that on Lag baOmer there is always an unusually high number of 3 year old boys having their first hair cut.